Are these 24028 Stabilizing Scissor Jacks to be mounted permanently on the trailers chassis? 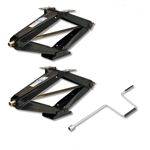 For the 24028 scissor jacks, you can either bolt on to the frame or weld on to the frame. Below is a link to the installation manual.